At last you do not have to struggle any more in your practise with teaching patients relaxation techniques. The Relaxation CD can help you with this challenging task. Clients now can take it home and practise the relaxation techniques in their own environment. Relaxation techniques are used for the treatment of various physical as well as psychological problems. Deep muscle relaxation are often associated with slower heart rate, lower blood pressure and slower and more even breathing. Asthma, headaches, hypertension, acute and chronic pain, postpartum stress, post-operative stress and the side effects of chemotherapy are some of the physical problems that can be greatly benefited through deep-muscle relaxation. A meta-analysis published in BMC Psychiatry (June, 2008) confirms that relaxation, in particular Jacobson’s progressive relaxation, autogenic training, applied relaxation and meditation – is consistently effective in reducing anxiety. Depression, sleeping disorders, nightmares and post-traumatic stress disorder are psychological disorders that definitely benefit from relaxation training. The cd is currently also used with great effectiveness as part of the treatment programme of addictions. The cd can also be used as part of Stress-management training in corporate environments. Relaxation training can be used by any therapist involved in the psychological treatment of patients and should be monitored by a qualified therapist/counsellor to be efficient. 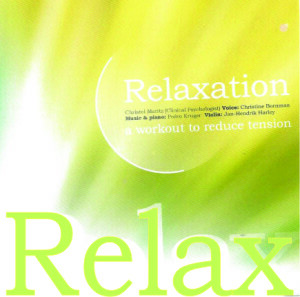 The CD comprises both Progressive relaxation based on Jacobson’s method as well as Auto suggestive relaxation. Complete instructions available in the cover. Also available in Afrikaans. Next Article Next Article: Sleep contributes to overall happiness!